My how plans can change! I guess that’s one of the beauties of having one’s home in tow, the freedom to wonder on a whim; the freedom to change plans and directions as needed or rather as wanted; the freedom to move when you don’t like the weather. 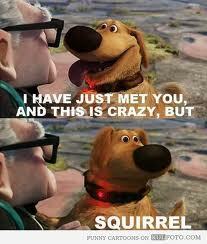 There are days I feel I have about as much attention span as the dog featured on the cartoon movie Up….. “squirrel”. However, instead of returning to the conversation, I’m off and running. I’ll admit, it’s kind of fun being distracted and so noncommittal. 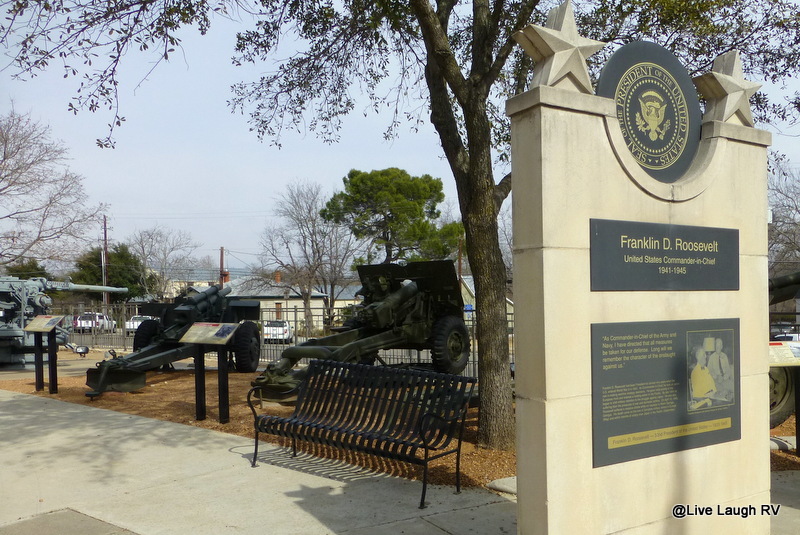 After the month of January in Rockport, we thought we’d spend the month of February exploring parts of San Antonio, Austin, and Fredericksburg. 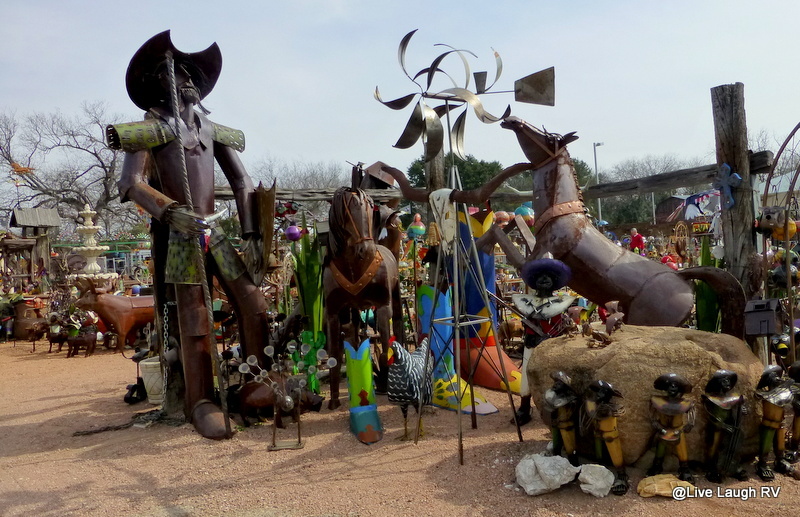 We settled into a gorgeous campsite at the Cranes Mill Park campground at Canyon Lake allowing us to easily explore San Antonio and the surrounding area, but weather and an appointment had us rearranging our February schedule. We had a wonderful time exploring San Antonio’s downtown: The Alamo and River Walk are sights not to be missed. We would’ve loved to have experienced even more of this great city but weather and time were not on our side. Projected inclement weather and an appointment in Phoenix had us on the road sooner than planned. We had to prioritize our must see list and seeing the town of Fredericksburg was high on that list. We originally had the intention of spending several days in Fredericksburg, but since Mother Nature was not in a kind mood we’ll settle for a day trip. Thank you to all who commented or sent emails to me on things to see and do in the area. Your recommendations were wonderful and we tried to take in as many sights as possible. What we didn’t have time for on this trip, we will definitely make time for on a future visit. It’s a Wednesday morning and we get an early morning start for our 65 mile (105 Km) trek through the Texas hill country. 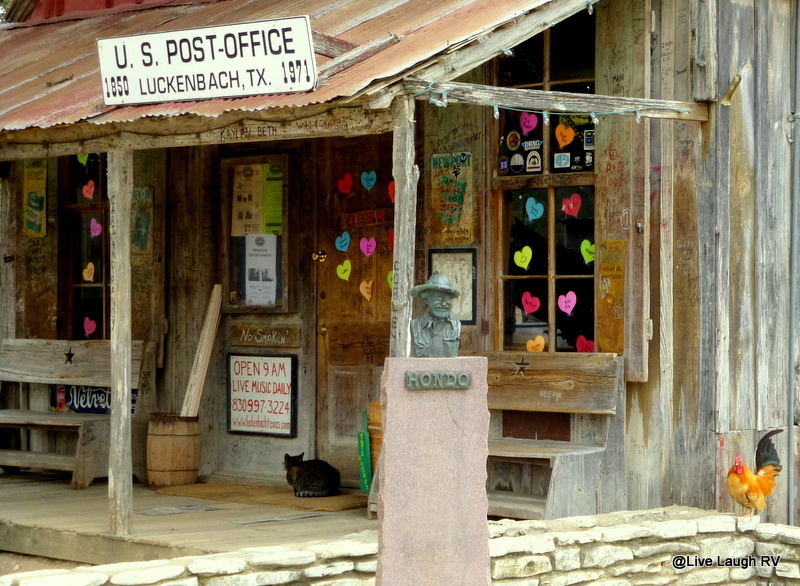 We take a series of country roads with a side stop at the small town of Luckenback, Texas. Luckenbach is an out-of-the-way hill country place preserving a small piece of Texas history. We pull up to the post office / general store / saloon (talk about multi-tasking) and are greeted by free roaming chickens. We step inside the building and it’s like stepping back in time. 10 acres of rolling hill country surrounded by large oak trees, a couple of creeks, a dance hall, store, and beer joint is the perfect place to kick back and enjoy a festival; chili cook offs, a mud dauber festival, music fests, the annual Hug-in around Valentine’s Day are just a sampling of fun things to experience here in Luckenbach. Waylan Jennings even wrote a song about going to Luckenbach to escape the rat race of city life and Willie Nelson has held a couple of 4th of July picnics here. 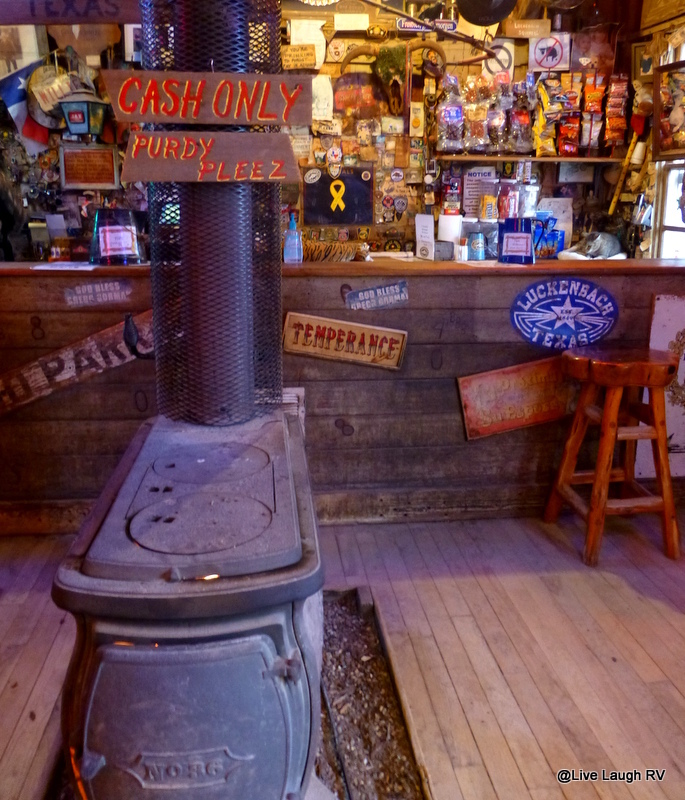 Since it’s a blustery winter morning, nothing much was happening except for a nice warm fire in the pot belly stove for Al, me and the 2 ladies working to stand near and chat while warming our hands. Fun stop indeed, but Al and I were getting hungry. We didn’t have any breakfast before heading out that morning and thus continued the trek to Fredricksburg. It doesn’t take us long before we find the highly recommended “Old German Bakery” and indulge in some yummy pastries and coffee. It did not disappoint and we left with a box filled with more delectable treats to take home and enjoy. We explore Main Street before heading over to the Lady Bird Johnson Municipal Park checking out RV Parks along the way. The municipal park offers RV parking as well as the Fredericksburg RV Resort and the Oakwood RV Resort. All three look like they would work nicely for a future visit. There is also a KOA Campground on the outskirts of town that I’m sure would also work. With that tidbit of business out of the way, we head on over to the Admiral Nimitz Museum and the National Museum of the Pacific War. 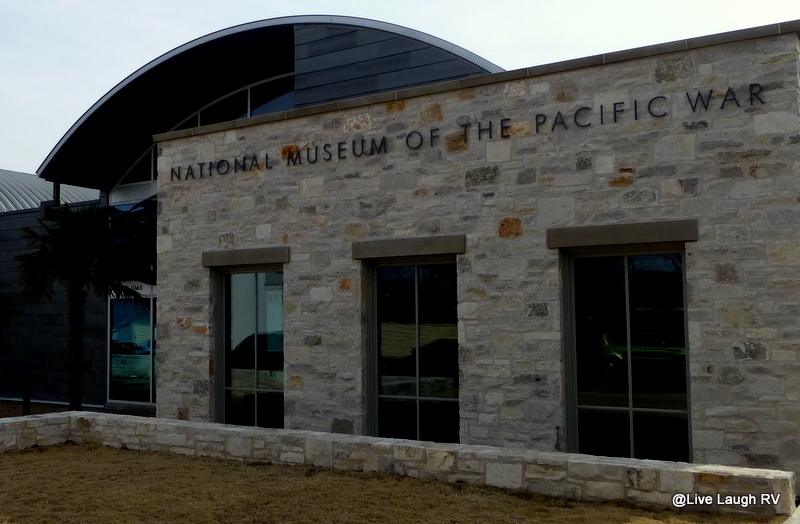 The museum honors the eight million Americans who served in World War II’s Pacific Rim against Japan. Among those who served was a Fredericksburg native; Fleet Admiral Chester Nimitz. Unfortunately time was not our friend that day and our museum tour was somewhat abbreviated and cut short by our growling stomachs and a quest to take in as many sights as possible. We make note that the museum admittance is good for 48 hours, allowing guests to take their time visiting this special tribute. We contemplate returning after lunch. 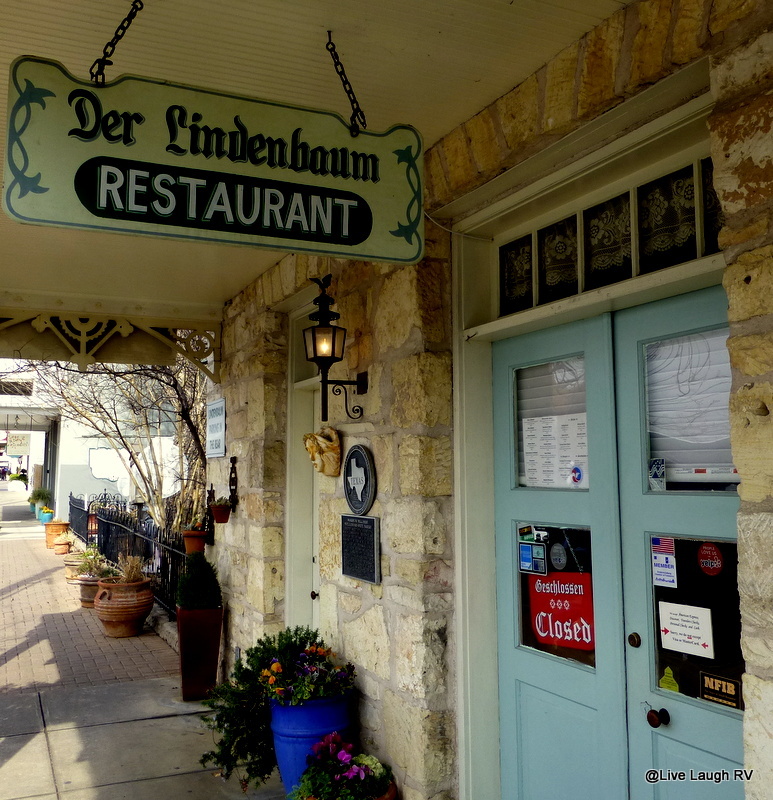 Fredericksburg has a strong German heritage and therefore German food is usually the popular choice with visitors. Al and I consider lunch at Der Lindenbaum, another highly recommended restaurant, but for some reason we just weren’t in the mood for German food. 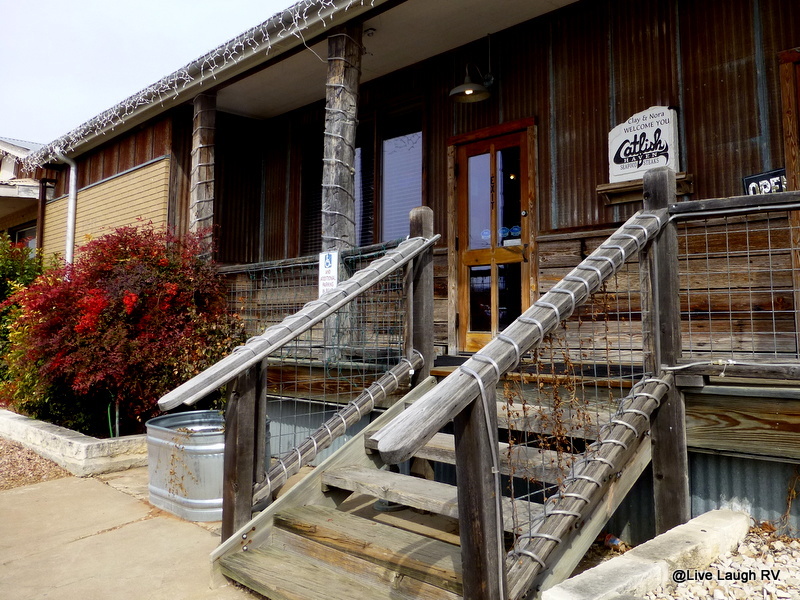 That morning while driving up and down Main Street getting a feel for this quaint hill country town, Al noticed a place at the far west end of Fredericksburg called Catfish Haven. It appears Catfish Haven is a restaurant frequented by locals. As patrons entered, the staff would routinely welcome guests by name as well as most of the diners all knew each other…..typical small town joint that we always get a kick out of. And the food was delicious. Yes, we had good ole fashioned fried catfish with a side of tater totes and hush puppies…..yum-mee! We’ll start that cleanse next week….LOL. Next up, we visit the LBJ Ranch…..
Cranes Mill Park looks great. We haven’t been to Texas in years, but I remember really loving the Hill Country. Where are you headed next? What great sights you took in while in the Hill Country. Thanks for the great tour. Our trip there was a bit of a whirlwind as well but we did spend quite a bit of time at the LBJ Ranch. Thanks for the whistle-stop tour. I hope you bought that corset for me. I could do with a waistline like that! Petite . . . . hmmmm . . . had your eyes tested lately? But thanks for the compliment! Love the arm chair traveling today – Great Captures:) Happy Tuesday! That is suppose to be next time. LBJ Ranch is a treat. Paul and I had a wonderful visit. Be sure to take in all the “OLD” items in the kitchen of the “Texas White House.” I can remember so many items in my mom and dad’s house when I was growing up. We got so caught up at the Sauer-Beckmann Farm with all the old things we started running out of time. I know next visit we’ll definite allow more time to take it all it. 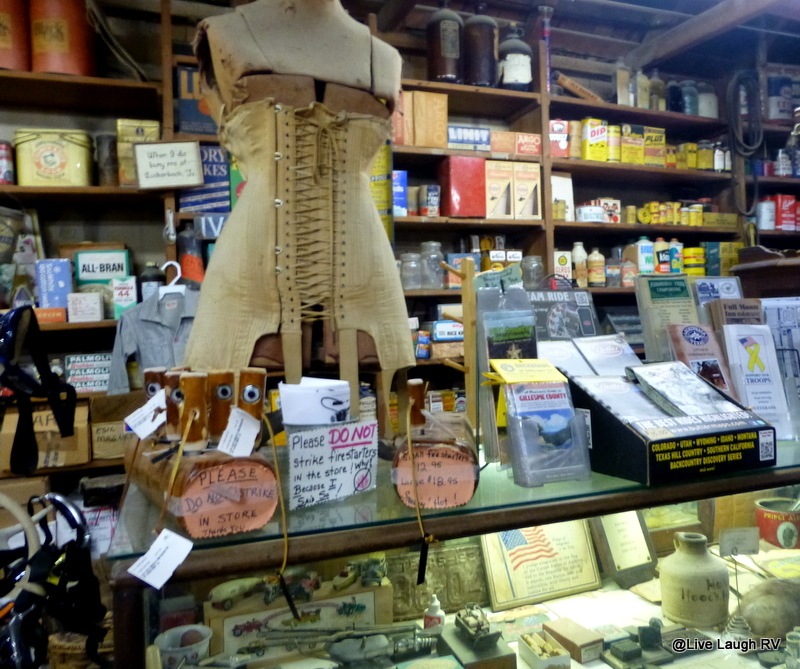 It was fun getting an overall tour of Fredericksburg so we know what to expect next time. My daughter was the first one who told me I acted like that dog….”squirrel”. I call it multi-tasking LOL. I’ve been going back to your site and reviewing your Texas travels to see what we missed and should catch next time. Love your bird photography! Love the chickens! What a whirlwind tour, sounds like you once again made the best of things and had some fun. I would definitely recommend Texas. There’s a great deal to see and do. Our next time through we hope to take advantage of all the state parks. Hey how about we send John and Al through the museum and we’ll go do ‘girl’ things? Those museums just can’t seem to grab my interest. Did you hear any locals speaking German? I had at one time been told that area (which is several towns) is the largest German community outside of Germany. Will have to try and look that up to see if still true. I will look up the address of a hill country winery that I think is the best we have been to. Do not have experience with a lot of wineries. This one is in the back woods in the area you were at and very popular. Remind me if I do not get you the address. There seems to be a lot of wineries in the area and some very pretty ones at that. We didn’t happen to hear anyone speak German but since it was a cold blustery day, the streets were pretty empty. I’m not sure it hit 40 degrees that day and with a cold wind it kept people inside. We look forward to coming back when it’s warmer! I look forward to our next visit to hill country. When your not in the mood for German it’s hard to go wrong with catfish. When I visit an area, one of my first questions is where do the locals eat. I much prefer the local dives with good food to the tourists places with just okay food at higher prices. Sounds like you found one. The pacific war museum would hold great interest for me. Sunny here, in the 60’s yesterday and today there are birds chirping and I sense that I will actually survive this dreadful winter. You two drive safely and stay well. They had a great model of the USS Nimitz that we really enjoyed. I was on the real deal when it was in port in Coronado years ago. Al could have spent the entire day at the museum. Sorry we missed you while you were in San Antonio! We are on our way to Las Vegas this Saturday, stopping at Lake Pleasant Regional Park northwest of Phoenix for two nights, then we’re off to Lake Mead RV Village for five nights. We plan to see relatives in Henderson and Las Vegas, NV. How long will you be in Phoenix? This is so great, Ingrid! Safe travels on your continued journey! I LOVE that you are in Texas. I am taking notes on what to do when I get there the next time☺☺It is like you stepped back in to time here…too fun. 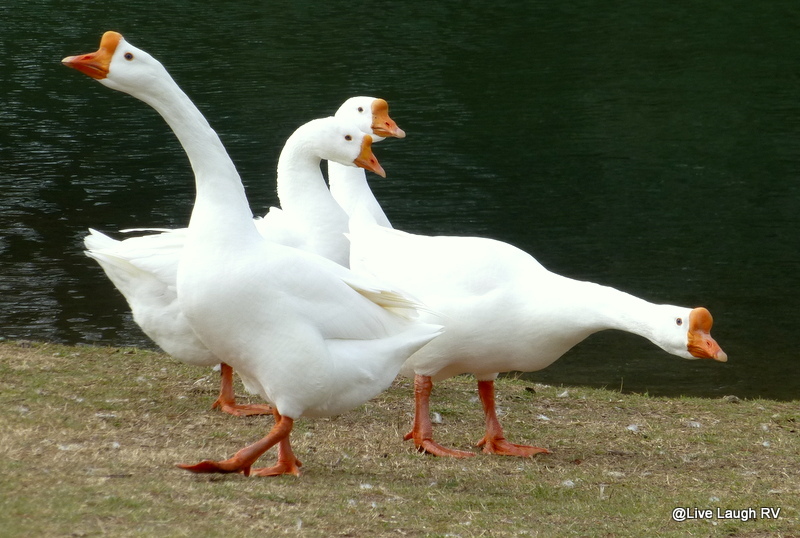 I was grinning the moment I saw your roosters and the ducks at the end. Why? 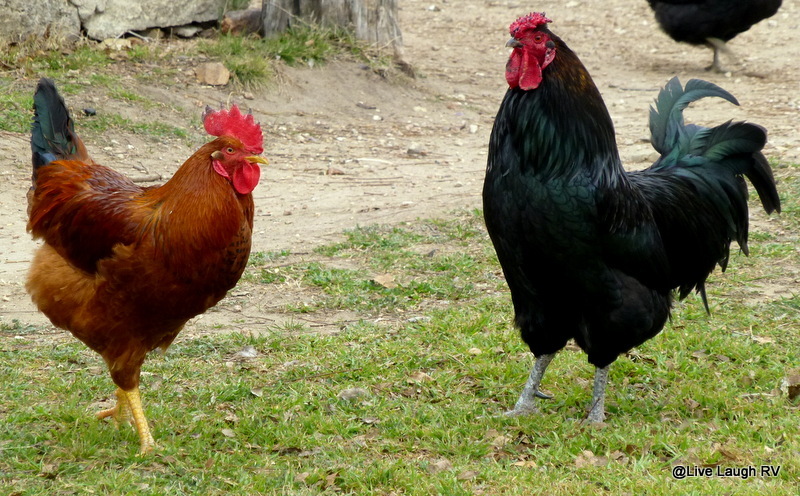 Because we have seen a lot of those roosters at Key West and the ducks here at Davie. Looks like we are on the same bird track these days! Lets keep those list and if your wishes come true we might be seeing each other next winter! yeah! Glad you enjoyed your visit and will look forward to your next post as well. I think the museum is so smart to allow visitor’s that 48 hour time-frame, as it actually helps to support the local businesses for food and shopping breaks while still giving visitors a good opportunity to take in all the museum has to offer without having to feel rushed. Sorry you didn’t get to eat German food, though! 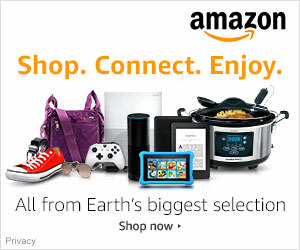 It’s pretty awesome there. Isn’t that artistic windmill awesome? Ah, if I still had a yard……. 😉 But I did find something really cute for my sister-in-law’s yard and it’s not too difficult to transport. Size does matter, ya know! How’d ya know LOL! 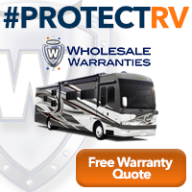 Alas, hubby insisted on something more RV friendly…..party pooper!